This is a review of Jeevan Herbals’ Hair Regrowth Pack. The company claims to promote growth of natural, healthy hair. They also claim to improve the length, quality, and density of your hair, in addition to aiding new growth in areas suffering from hair loss and follicle degradation. Read on to find out more about this supplement and find out if it’s the right product for you. No ingredients could be found anywhere on the company’s website. In their preparation of the hair oil that comes as part of the package, they claim to follow a “standard Indian tradition” when creating the formula. Javeen Herbals also claim that they use exceptionally “rare herbs” in their formula. No other information could be found, either on the company’s web site, or on secondary seller’s web sites. Again, no real information could be found on Javeen Herbals’ web site that pertains to instructions on use, dosage, or any other specifics. Javeen Herbals’ only real information pertaining to dosage and use are contained in a single sentence: “It is easy to use”. Physicians tend to suggest that individuals should never exceed the recommended dosage on a product such as this, however we cannot confirm that statement without any sort of nutritional guidance. Mothers (either pregnant with child, or nursing), as well as individuals under the age of 18 should always consult with a physician before using any vitamin supplement. As we failed to uncover ANY information regarding this product’s ingredients, we cannot comment on the supposed effectiveness of Jeevan Herbals’ Hair Regrowth Pack. No side effects are listed on the company’s website, although caution is always encouraged when starting any new regimen. 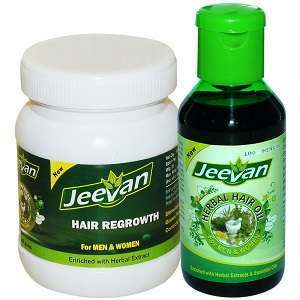 One order of Jeevan Herbals’ Hair Regrowth Pack costs $47.27 when converted from the Indian Rupee. As there are no amounts listed on the web site, it is uncertain how long an initial order of Jeevan Herbals’ Hair Regrowth Pack would last. There are no discounts available through Jeevan Herbals’ web site, nor are there any sort of subscriptions available for additional savings. As the shipping costs vary (with the exception of free local shipping within India), it is uncertain what the final cost of this package would be. Jeevan Herbals advertises a full refund within 45 days of receiving your supplement. Plenty of customer reviews could be located on the company’s site, and they seemed mostly positive, landing between 4 out of 5 stars to 5 out of 5 stars. After scouring the company’s web site, we could find no mention of the details pertaining to this supposed guarantee, however an e-mail address, as well as company phone number were listed. Jeevan Herbals’ Hair Regrowth Pack doesn’t seem like a safe bet, especially for customers outside of India. While a lot of their advertisements SEEM promising, they list absolutely no information about quantity, ingredients, or instructions for use. Customer reviews were overwhelmingly positive, but without any additional information, we cannot verify any of these claims. Their claims of “rare herbs” and recipes based on Indian traditions offer no concrete evidence to support their lofty claims. Lastly, all other web sites that we discovered selling Jeevan Herbals’ Hair Regrowth Pack lacked return or contact information, which does not evoke confidence. John Brownstone	reviewed Jeevan Herbals Hair Regrowth Pack	on June 28th	 and gave it a rating of 3.5.